The Strong Towns message is inspiring towns and cities across the continent to take a serious look at their growth and development practices, and plan new paths forward that will strengthen—not bankrupt—their communities. Pelham, Ontario is one of those places. Darren Ottaway is a Strong Towns member and Chief Administrative Officer for the Town of Pelham and last July, he arranged for Strong Towns President Chuck Marohn to give a series of presentations for Pelham leadership, sharing insights about the problems with our current development model and suggesting a better approach to growth. That conversation has already sparked a transformation in Pelham, illustrated in a new document that the town put together to talk about their plan for the future, led by Ottoway and his colleague, city planner Curtis Thompson. 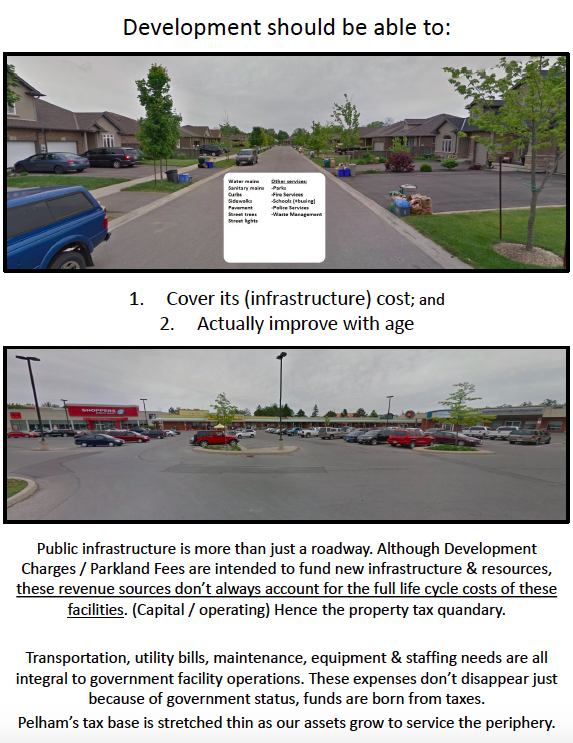 Modeled after a similar document created by Hays, KS, "the ‘Stronger Pelham’ document illustrates the problems faced by local government depicted through a Strong Towns lens which better considers the true liability of infrastructure investments," Pelham government leadership explained in a write-up about the process. Pelham staff say the research that went into the document "questioned prescriptive and long established Zoning By-law regulations." A Stronger Pelham begins by showing the deficit the city is currently facing, then illustrates, through a series of examples and diagrams, how Pelham's current model of development—from the way homes and streets are laid out to how much parking is built in shopping areas—is causing this financial trouble. The document compares the value per acre for different styles of development and demonstrates which are the most financially productive. The Province has been vocal by calling for more flexibility on matters such as; diversity in housing types and ranges in floor areas to better balance affordable housing needs, foster complete communities and to avoid discriminatory land use policy. Implementation and integration continues to be the on-going challenge faced by our community. The objective was not to unveil some grand resolution, but to actually raise important questions; questions that in the future can inspect the overall strength & sustainability of development and infrastructure proposals. By giving policy and decision makers the relevant data and appropriate comparables, we’re optimistic that new political goals can better align with social, environmental, economic and community values. View the full Stronger Pelham document. Strong Towns is making an impact is towns and cities across the continent. If you care about our mission and want to help us reach more communities with our message, please support Strong Towns by becoming a member today.